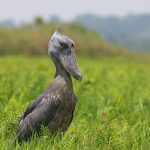 Although Shoebills are not easy birds to find on a Birding Safari in Uganda, Our experienced guide helps you find your way through Mabamba Swamps just outside Entebbe. An excellent blending grey camouflage and the fact that they stand undisturbed and motionless for long periods of time, making it hard to find them. A very keen birder will be able to spot them and and our guides sometimes manage to find them standing hunting for fish after 45 minutes of searching. The Shoebill below was spotted concentrating on a spot in the swamp, targeting long lung- or mudfish. We managed to maneuver our mokoro into fair distance and our guest was able to create a few very nice images.